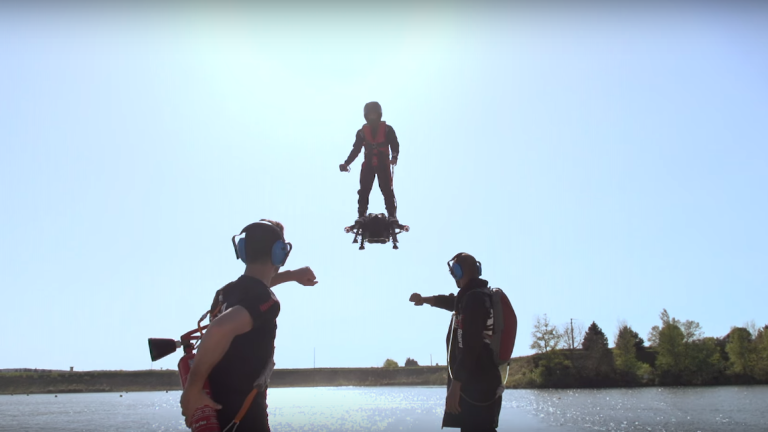 French jet ski champion and inventor Franky Zapata has set a new Guinness World Record title for the farthest hoverboard flight. The feat, which was undertaken off the coast of Sausset-les-Pins in the south of France on Saturday morning, saw Zapata power up to a new benchmark distance of 2,252 metres (7,388 feet) on his Flyboard Air hoverboard. For comparison, the previous record that was set last year by Canadian Catalin Alexandru Duru, was only 275.9 metres (905 feet, 2 inches). According to Zapata Racing, Franky's company, the Flyboard Air can reach a claimed maximum height of 10,000 feet, with a maximum speed of 150 kilometers per hour (93 mph). Speaking after the amazing stunt, Zapata said that it had "really been a life's work". Zapata Racing has created a series of hydro-propulsion hovercraft in the past, with the devices connected via hose, however the Flyboard Air uses an "Independent Propulsion Unit" to fly connection free for up to 10 minutes. To watch the futuristic Flyboard Air in action then check out the below video.